Intel has introduced a new family of Thunderbolt 3 controllers that bring support of the DisplayPort 1.4 standard to TB3 ports. The new Titan Ridge family of controllers pick up where Intel's previous Alpine Ridge controllers left off by incorporating new DisplayPort functionality, and for the first time, a USB-C fallback mode when used as a sink/peripheral device. This mid-generation update for Thunderbolt 3 will allow the standard and devices using the new Titan Ridge controllers to catch up with current display standards, and work better with the next generation of UHD displays. Intel’s JHL7x40 family of Thunderbolt 3 controllers supports two main features of the TB3 technology, including PCIe 3.0 with 40 Gbps data transfer rate as well as USB 3.1 Gen 2 with 10 Gbps data transfer rate. The big difference is that Titan Ridge adds support for allowing two DisplayPort 1.4 streams to be encapsulated into the TB3 connection, versus two DisplayPort 1.2 streams in case of the previous-gen TB3 controllers. What isn't changing here is the actual TB3 signaling standard or the cabling, so the total amount bandwidth offered by the previous-gen Alpine Ridge controllers and the new-gen Titan Ridge chips is the same. The shift in DisplayPort standards is a small but important one for Intel and TB3 device manufacturers. A single DP 1.2 stream is enough for 4K@60Hz displays, but for TB3-enabled monitors beyond that – such as 5K monitors or 4K HDR monitors – vendors would have to resort to multi-tile monitor configurations. Which certainly works for early adopter products, but it's undesirable in the long run due to the higher costs and configuration hassles of a multi-tile monitor. So as these types of monitors become more mainstream and pure DisplayPort monitors shift over to DP 1.4, Thunderbolt 3 has needed to catch up. Meanwhile, because DP 1.4 has greater bandwidth requirements, it's worth nothing that TB3 displays incorporating Titan Ridge and DP1.4 still cannot exceed 40 Gbps offered by TB3. Formally, one DP 1.4 stream can carry 25.92 gigabits of data per second (32.4 Gbps with overhead) and can support a 5Kp60/8Kp30 display without compression, or a 5Kp120/8Kp60 monitor when the Display Stream Compression 1.2 (DSC) technology is used. However, since in case of the TB3 there is a bandwidth limitation, it will not be possible to plug, say, two 4Kp120 monitors to a single TB3 port on a laptop, despite the fact that Titan Ridge can carry two DisplayPort 1.4 streams. At the same time, something like a single 4Kp144 is now a theoretical possibility (at least for systems with a dGPU). 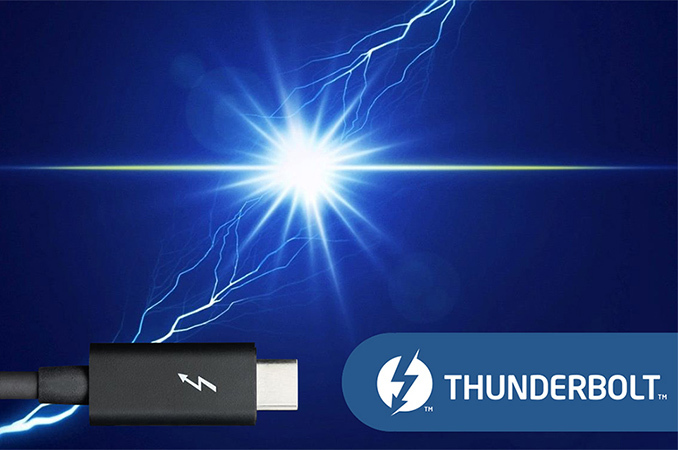 Obviously, since the Thunderbolt 3 technology supports optional USB Power Delivery 3.0 technology, a TB3-enabled laptop can be powered by its TB3 display connection, greatly simplifying setups. Overall the Titan Ridge family of Thunderbolt 3 controllers consists of three parts: the JHL7540 and the JHL7340 chips for PCs, as well as the JHL7440 chip designed for peripherals. The JHL7340 and the JHL7540 support one and two TB3 ports, respectively, and work exactly like their Apine Ridge predecessors but with the addition of DisplayPort 1.4 functionality. The JHL7440 however is much more interesting. It too is a dual-port controller, but it is designed specifically for peripherals and is intended to enable compatibility between TB3 peripherals and USB-C hosts. Today’s TB3 docks and displays only work with systems featuring Thunderbolt 3 ports, as there's no way for Alpine Ridge controllers to fall back to being USB-C sinks. By contrast, the JHL7440 controller can fall back for use as a USB-C sink, allowing it to offer "basic compatibility" with USB-C ports. This of course gets into matters such as USB-C's many alt modes – particularly DisplayPort Alt Mode – by at the end of the day the idea is that with Titan Ridge, TB3 peripherals can be connected to a USB-C host and retain most of their functionality. So think TB3 drive arrays that will still operate with less bandwidth, TB3 monitors that may slow down or lose non-display features, etc. As for why Intel is making this move now, it's worth pointing out that Intel plans to make the Thunderbolt 3 spec available to the industry under a nonexclusive, royalty-free license this year. So it makes a lot of sense for Intel to maximize the compatibility of TB3 peripherals before third-party TB3 controllers emerge. TDP 1.2 W 1.7 W 2.2 W 1.7 W 2.2 W ? ? ? Package Size 10.7 × 10.7 mm ? ? ? Price $6.45 $8.00 $8.55 $8.00 $8.55 ? ? ? Intel’s Titan Ridge controllers will continue to require an external USB Type-C multiplexer and a PD 3.0 controller. Meanwhile, if today’s solutions use the TI TPS65983B chip, there will be other options for the Titan Ridge. Intel has not published pricing of the new Titan Ridge controllers and intends to do so later in the quarter. As for the availability of devices featuring the new controllers, I suspect we're going to see them sooner than later. Intel’s TB3 software has actually supported the new controllers since mid-2017, hinting that the development of actual hardware by Intel’s partners should be well under way by now. So those TB chipset have been available for a while. Just received a Lenovo X1 Extreme that comes with the Titan-Ridge. But where do you find those USB-C DisplayPort 1.4 cable/adapter? So far I'm yet to find one. Well It would be interesting to know which monitors support DP 1.4 so my guess for higher end monitors like 5K and 8K this chips is needed. For me the best way I used Thunderbolt on my Dell XPS 2in1 is used a Dell HUB that support Display Port and HDMI and other ports. The biggest problem I notice with USB-C ( not just Thunderbolt ) is that different HUB work different between brands - for example my Samsung TabPro S must used different one then Dell USB-C port. Intel is selling chips for both the computer side and the peripheral side. The computer side can already fall back from TB3 to USB-C (including DP), but current-gen TB3 peripherals (monitors, docks, etc.) can't. With the new Intel chip in TB3 monitor/docks/etc, they can work at reduced speed with USB-C (non-TB3) computers instead of not working at all. To give a more concrete example, the current LG Ultrafine 5k Monitor only supportsTB3, not USB-C. And, on without special drivers and two DP 1.2 streams, it only supports 4k. There's no reason that 4k couldn't be run over USB-C + DP, but the current gen doesn't support falling back to USB-C. With this chip, it could, and could therefore have much wider compatibility (at 4k).